Patchouli (Pogostemon cablin (Blanco) Benth; also known as patchouly/ pachouli is a species from genus Pogostemon and bushy herb of mint family. Bearing small pale pink-white flowers, the plant is a native to tropical regions of Asia. Patchouli CO2 Extract Oil is extracted from young leaves that are dried & fermented prior to steam distillation and helps in yielding 2 - 3 % of extract. This oil improves with age and has fuller, more well rounded odor. 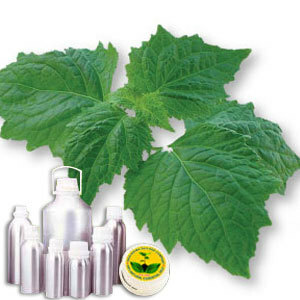 Patchouli CO2 Extract Oil has grounding as well as balancing effect on emotions & banishes lethargy while helping in sharpening wits, fighting depression as well as anxiety. It is also said to create amorous atmosphere. Further, it is effective for fungal as well as bacterial infections and is of great help for insect bites. It can also be used as insect repellent. Its excellent diuretic properties also makes it effective in fighting water retention & breaking up cellulite, thus easing constipation & helping to reduce overweight.